Today I'm showing you a card I made for Impression Obsession's Splashes of Color challenge and SSS Monday Make your own background challenge. 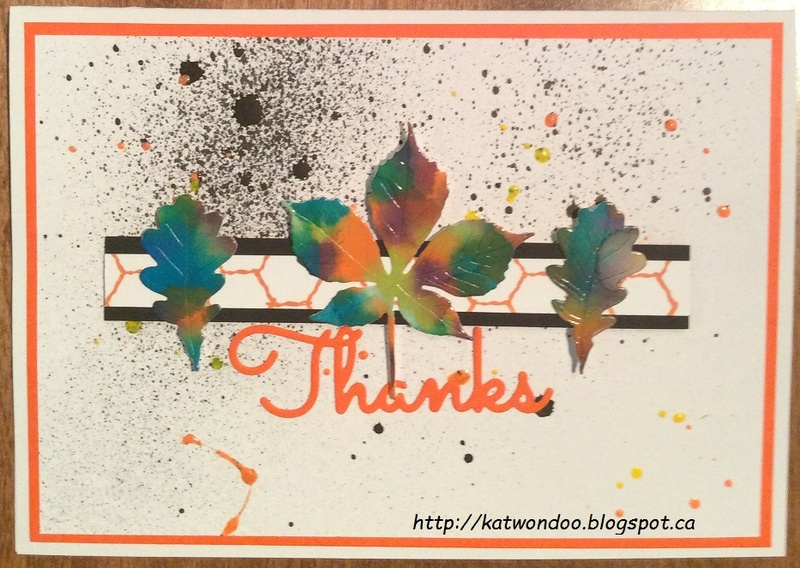 This week-end, I made many leaves using my new die and alcohol inks so I still had few left. I first made my background by spraying my black ink, then yellow and orange ink. The thanks word was made with a die from IO. I stamped the chicken wire stamp on white cardstock with orange ink and mounted it on black cardstock and then on 2D foam tape. I glued my leaves and voilà! Lovely splattered background! It works beautifully to offset your gorgeously colored leaves! Thanks for joining us this week in "creating your own background" on the Simon Says Stamp Monday challenge.